Food delivery is not something new in the restaurant business, especially for businesses that serve easy and inexpensive crowd-pleasing meals like pizza, pasta, Asian cuisine, or even Drive-In classics like burgers and fries. As busy as life in the 21st century gets for most working people, being able to have a hot meal delivered to your door is quickly moving from being a luxury to an essential part of working life. While digital ordering for pickup has recently become an industry norm in food service, integrating the option to have your meal delivered is still an emerging trend for many restaurants. However, the fact that even fast food giants like McDonald’s and Subway have an online ordering app clearly indicates that ordering and payment are both quickly going mobile, and it will not be long before all delivery food service follows that trend. 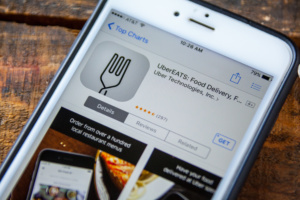 In the meantime, numerous third party apps and services like Grubhub, UberEats, and Seamless are beginning to offer takeout pickup and delivery orders from restaurants and eateries that do not offer delivery. These new delivery service players are collecting service fees and tips that could be going to your restaurant and staff, but are instead funding these tech startups to the tune of $1 billion dollar valuations for the top performing food delivery app developers. There are two kinds of online platforms currently occupying the majority of digital food ordering delivery services online. The first type, called “aggregators” got their start late in the DotCom boom around 15 years ago. The newer players are referred to as “New Delivery”, and most have been operating the past 4 years. 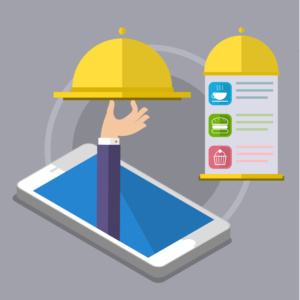 Aggregators are the providers that most online food service delivery customers are most familiar with: they take orders from customers comparing menus and locations on their app, then pass these orders onto individual restaurant delivery services. That’s as far as they go, and they usually get a percentage cut of the restaurant’s pre-tax subtotal funneling sales to those restaurants. New Delivery operators are taking things a step further with the process. Not only do they allow menu comparison shopping and collect payment and orders for restaurants within their network, but they also provide their own logistical support for food delivery. This allows restaurateurs without their own staff of drivers or fleet of vehicles to offer delivery services when they would otherwise be unable to provide delivery to customers ordering by phone or digitally. So the real question is, just how much money is there in food delivery service? Let’s take a global perspective on this: worldwide, the delivery food service brings in approximately $160 billion dollars. That relatively large sum actually comprises just 1 percent of the total world food market, and 4 percent of total sales for restaurants and fast-food chains. Currently, delivery is anticipated to grow at a rate of 3.5 percent per year over the next five years. That translates to millions of dollars in sales every year with a consistent growth rate. How does most food delivery service happen? Believe it or not, most customers are still making a phone call and placing orders via the traditional method for delivery. In fact, 90 percent of all delivery food service sales are made by telephone. Now, stop and consider this for a moment: it is a well established fact that most customers order up to $4 more per ticket on average when using an online app to order. Imagine if you were adding $4 more to every delivery order you currently take over the phone. That is a tremendous increase in revenue, and so long as delivery fees are reasonable, it is unlikely that this trend of ordering more with digital ordering food services will stop anytime soon. Having the ability to order directly from a smartphone or mobile device without needing to re-enter delivery details every time you want your favorite meal from your favorite restaurant delivered to your door, is fast becoming a standard expectation among customers with busy lives and hungry families. 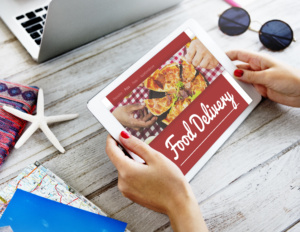 Online shopping apps have such pervaded consumer culture that they are now the preferred shopping method for many people, and that trend is beginning to expand into the food service industry, especially where delivery services are concerned. If you already have a customized app for taking digital orders that your customers can download and use quickly and easily on the go, you have taken a large step in the right direction. However, if you are not offering some form of delivery service as well, you may soon find yourself missing out on quite a significant source of revenue that will instead be going to more agile competitors or third party online New Delivery players. Start researching delivery services and how to integrate them into your existing mobile app. In an industry where retaining loyal customers while attracting new business is imperative, the return on investment from delivery can often make all the difference between long term success and failure.